What does this. . .
have to do with this. . .
this is after a soap and water clean-up. 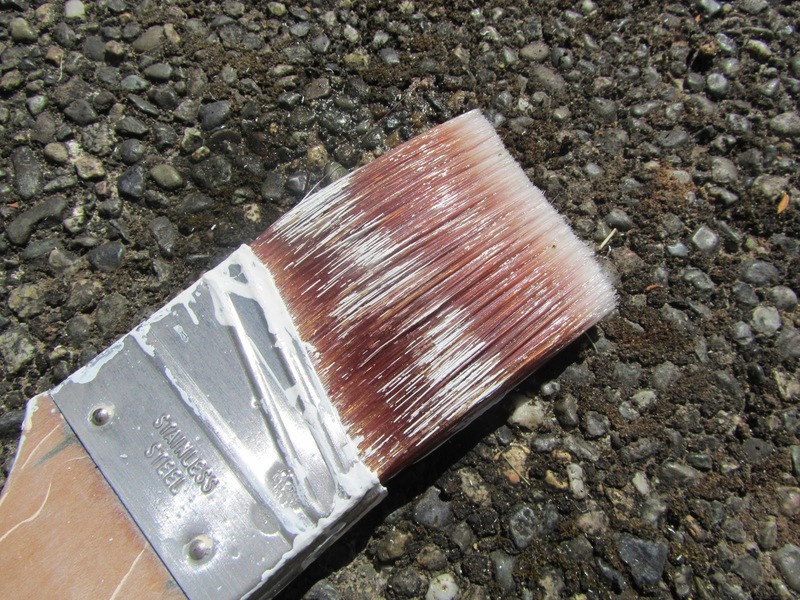 I don't know if this is the best way to clean dried latex paint from a paint brush, but it is the way a contractor, that we once hired to do some painting, cleaned his. So it's the way I clean ours. There are solvents out their to remove latex paint, but I prefer not to use them. 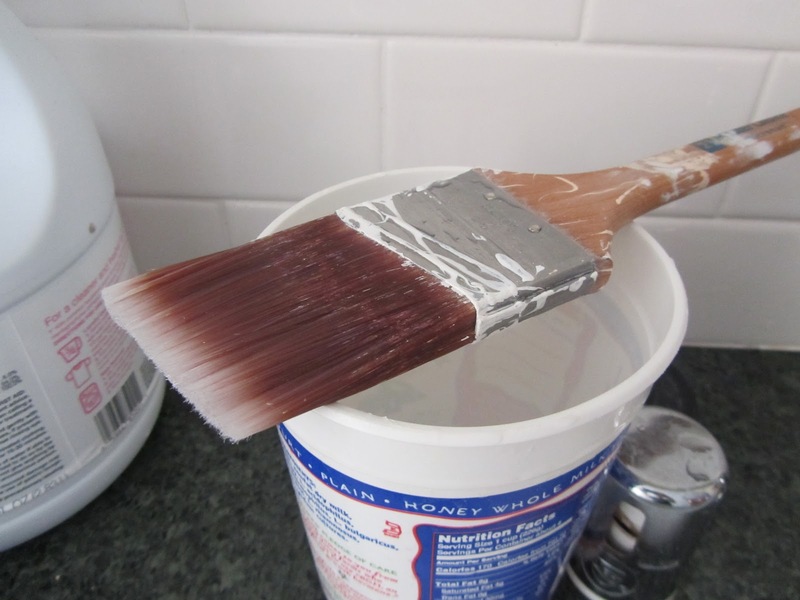 After a soap and water washing of the paint brush in the sink, I fill a large 1 quart container with soapy water. 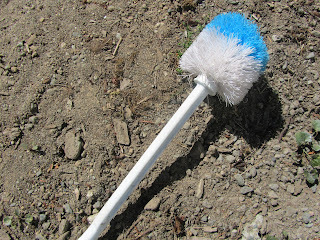 Outside, I scrub the paintbrush with the toilet brush. 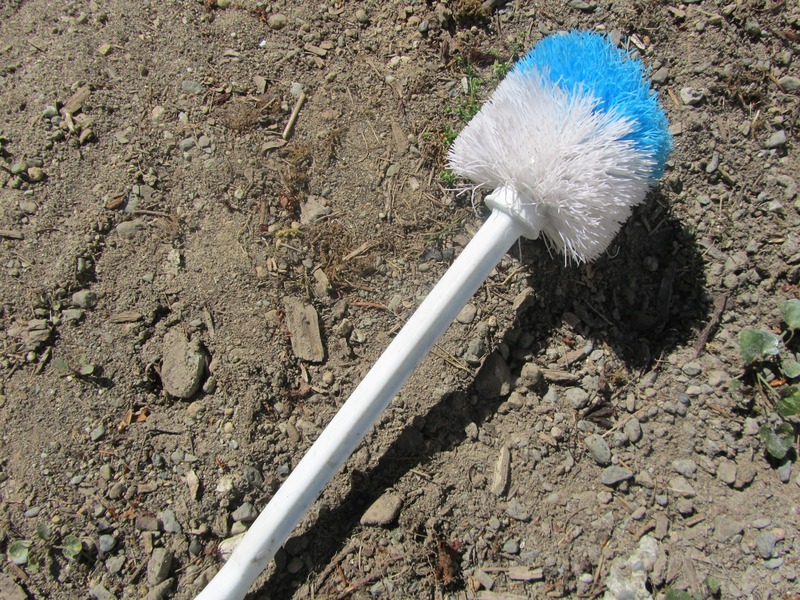 A clean grill brush would also work, but toilet brushes can be had for $1 at Dollar Tree. About half the dried-on paint will come off with about 5-10 minutes of scrubbing with a stiff brush. That's when I get out my pocket knife. I use the large blade on the knife to scrape off the majority of the remaining paint. I only spend about another 5 minutes, with the scraping. And I'm done. I would say about 99% of the paint can be removed with these two tools. As you can see, I don't worry about paint on the handle part of the brush or on the metal sleeve that holds the bristles in place. 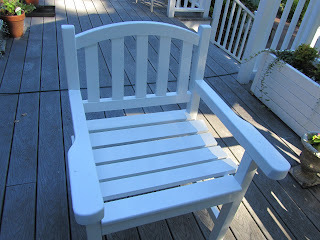 And, I can check off painting the garden chair, from my August to-do list! Woohoo! No more painting for a while for me -- painting's definitely not my favorite thing! 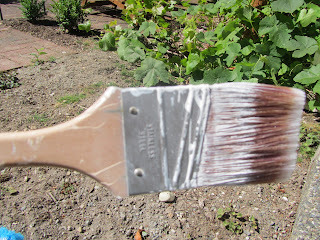 Thanks for the tips on how to clean paintbrushes. Your garden bench looks great, how many coats did you use? I've been painting some small things with acrylic paint recently but the colour underneath keeps bleeding through the white paint. I think I may have to try white spraypaint. I put on one coat of primer and 3 coats of acrylic latex. Did you use a primer before the white paint? On my last painting project I didn't prime first and the color kept coming through. This piece I primed one coat with a water-based primer, and that helped. There's an oil-based product in the US called KILZ. It really blocks colors and stains from bleeding through. (We have a new strip of cedar on the front of the garage that keeps bleeding and I'll have to use that there.) 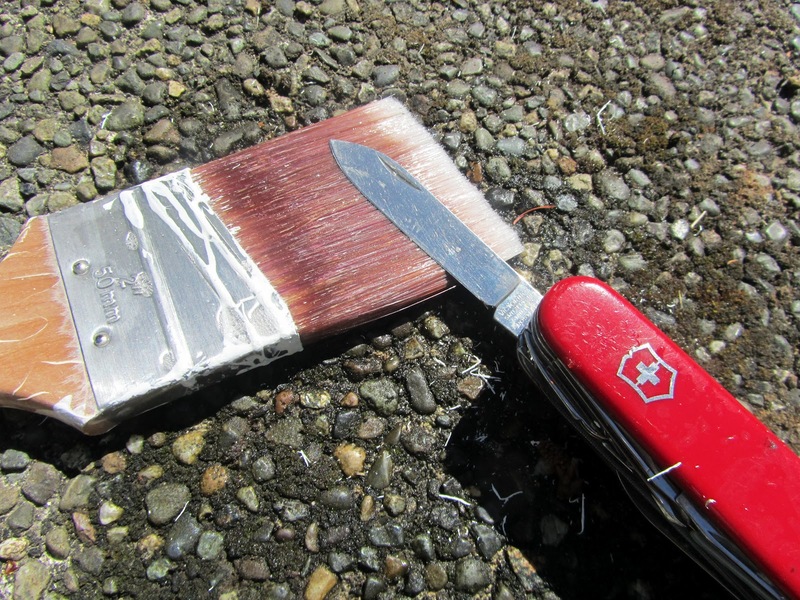 If you have any primer around, give it a try before you do the spray paint. Good luck! The last place we lived was paneled. You're right, no painting work required, which is nice. But the trade-off was it was rather dark inside. I bet your stenciling was cute! Never thought of cleaning a brush that way. I have always used my fingernails for the tough spots that don't come off easily from water. I love the chair! Can it come to my house? Sure, I'll just slip it in an envelope! Thanks for reading! Another cleaning method is to dip your brush in fabric softener after you finish (or in between sessions) and paint will come right off with a little water. I read this tip in a book from the library and it has worked well for me. Thanks for the tip! I will remember that! Good paintbrushes are expensive, and I've thrown away a few in my time, simply because they had so much dried on latex paint. Thats a very helpfil tip Lili. Thank you for sharing it with us. And did you read live and learn's tip on dipping the brush in fabric softener? I'm going to give that a try too. I hate when my brushes get all gunked up. Sometimes, though, the paint begins to dry on the brush, up near the metal sleeve, long before I'm finished painting for the day. I'll have to try the vinegar soak, as well. I'm always looking for less toxic ways to clean things. I've done the same sort of thing before, set something to soak with the plan to some back soon, only to totally forget about it (and wonder why it smells so bad in the garage or where ever). One of those, "oh well" moments.